pull-up bar – Your Life. Your Hustle. The first workout in the P90X series and even though I’ve done it many times I found tonight was pretty tough to get through. Allergies are plaguing me and I wanted to quit the workout after every set….but I didn’t! Push up bars are recommended but if you don’t have them no worries you can always use your dumbbells instead. You really should use either one of them otherwise you might end up with wrist problems. I had developed a ganglion cyst on my wrist a few years back from all the push-ups and it wasn’t pleasant so make sure you’ve got the tools that will enable you to be kind to your joints! Yes I said “pull-ups”. Have I ever done a pull-up? No. Do I ever want to be able to do pull-ups? Of course but it’s going to be a long hard road! I can pull 35lbs on lawnmowers but I can’t do a pull-up. Go figure! 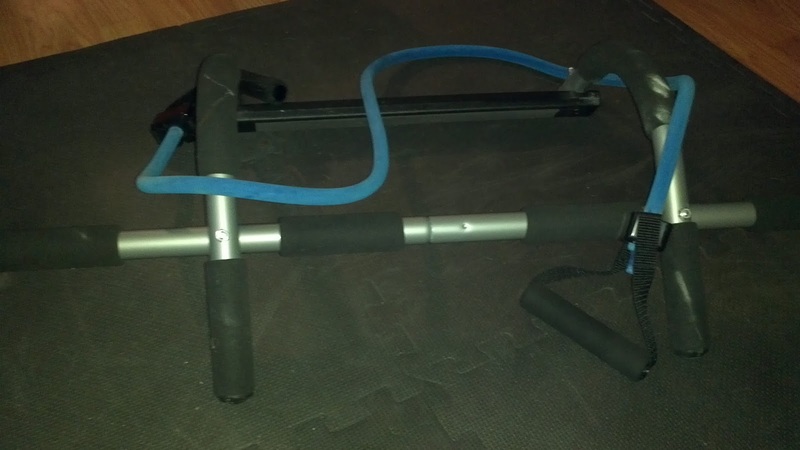 I’m relying on my trusty blue band to get a great back workout. I’ve got my pull-up bar rigged on the frame into my laundry room. Easy enough to unhook it and it put it away in storage. One day I’ll be able to do a pull-up with a chair and then without!! Not only does my chest and back get an excellent workout but I find that my biceps get a decent one as well. I figure it’s due to the reverse grip chin-ups and military push-ups. Talk about a burn! Chase this workout with AbRipperX and you’ve rounded off a nice 600+ calorie burn! This workout has got to be my “go to” workout. I haven’t actually done the full P90X routine for several months but I do this workout at least once a week because it hits the important muscle groups. Strong legs are super important and this workout is killer for legs! If you’ve never done it and you thought you were sore after Plyometrics this one is going to do you in! You’ll be sore for days BUT the next time you do it won’t be so bad. Argghhh those Sneaky Lunges kill me but they’re actually my favorite! 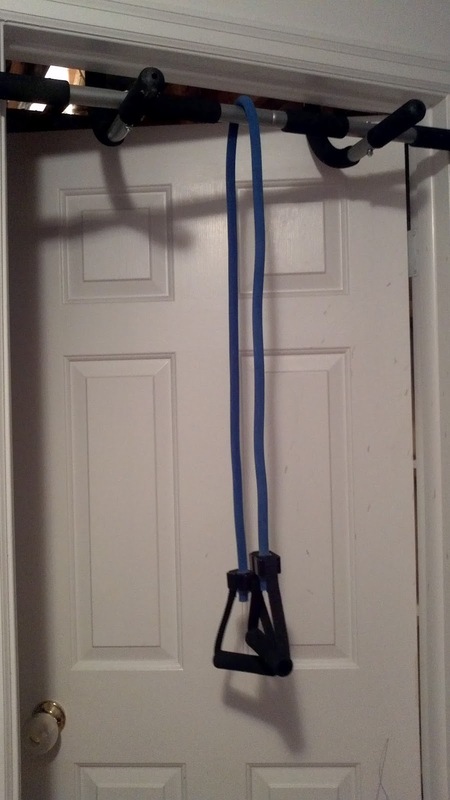 You’ll need a pull-up bar and if you’re like me and have never been able to do a pull-up in your life you’ll need bands. I have green, blue and black bands. The green is the easier of the two and the black is the hardest. As you can tell by the photo I’m using the blue/middle band. You can do the “pull-up” exercises seated or kneeling you just need to be sure you get the right angle. Remember water is your friend!